It's interesting that this £15 per metre speaker cable is more than halfway up the Atlas range and is rated by the company as one of its 'high performance' models. From some cable manufacturers, £15 per metre will hardly get you the time of day! Nevertheless, construction is not unlike other companies' in this price range, with a straightforward pair of 2mm conductors (hence the name: there's also Hyper 1.5 and Hyper 3.0), each insulated in PTFE, padded out with cotton and sheathed in PVC. 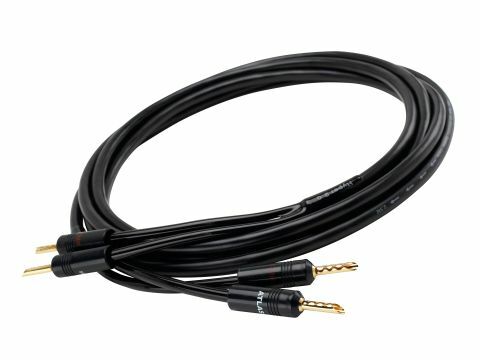 Cotton is more common in studio cables, where it reduces abrasion damage and microphony, but it could well be a useful attribute in hi-fi cables too. Hyper is available off the reel from dealers, or as a terminated set as in our sample, which, incidentally, has some very nice lightweight 4mm plugs, crimped to the wire. Whether the cotton plays a part we couldn't say with certainty, but there was plenty we liked about Hyper 2.0. It has a direct and unfussy presentation that shows no obvious signs of coloration and offers good, strong bass and open treble. If one compares it directly with fancier and dearer designs, it becomes apparent that there's a slight sacrifice in ultimate bass and detail, and its cousin, imaging. But Atlas has achieved something praiseworthy in making these compromises far from obvious with this wire. In fact, taken in isolation or indeed in the company of its peers, Hyper 2.0 is notable for its fine combination of precision and musical involvement.